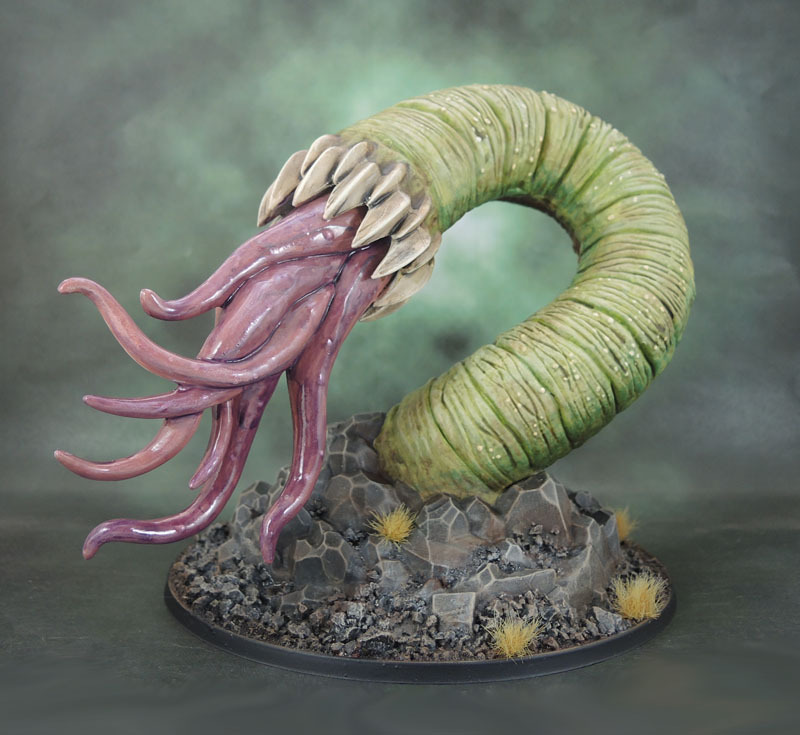 Realm of Chaos – Nurgle’s Children 2018 #12: Shadows of Brimstone Burrower as Giant Chaos Spawn (Monster March ’18) | Azazel's Bitz Box. This entry was posted in 40k, Board Games, Nurgle's Legions, Shadows of Brimstone and tagged #Monstermarch, 40k, Brimstone Burrower, Monster March, Nurgle Daemons, Realm of Chaos, Shadows of Brimstone, Warhammer 40000. Bookmark the permalink. I admire your painting skills and your imagination too. Good stuff. Yikes! That thing is huge! Thanks for putting the models next to it for comparison purposes. Yeah I took all of the original photos and then I thought I’d better probably put in an extra one as a scale shot. Love the wet look finish you’ve produced in the tentacles. You mentioned three different types of varnish, are you using paint on varnishes? If so, is that your usual goto? I’ve only used Testors Dullcote. I’ve thought about trying out satin though. I have both spray and paint on finishes in gloss matte and semi gloss. For this model the first coat was a hard-wearing varnish and then I went over the top of it with testors dullcote. After that had dried I painted the tentacle tongues with glass and then did the teeth with paint on satin. Looked at that, thought “gruesome!”,”nice paint job!” and “it’s how big?”! Impressive! Thank you, thank you, and yeah, I need to get more of my larger models painted! That thing is really cool! Jaysus, that’s huge! From the first pics I thought it was mounted on a 40-50mm base, and then you showed the comparison. Great work! Yeah, it’s a pretty decent-sized model. Monster March! That’s a big boy! Or girl! Or it! Feel better and good luck finishing! Thanks! I’m hopeful. 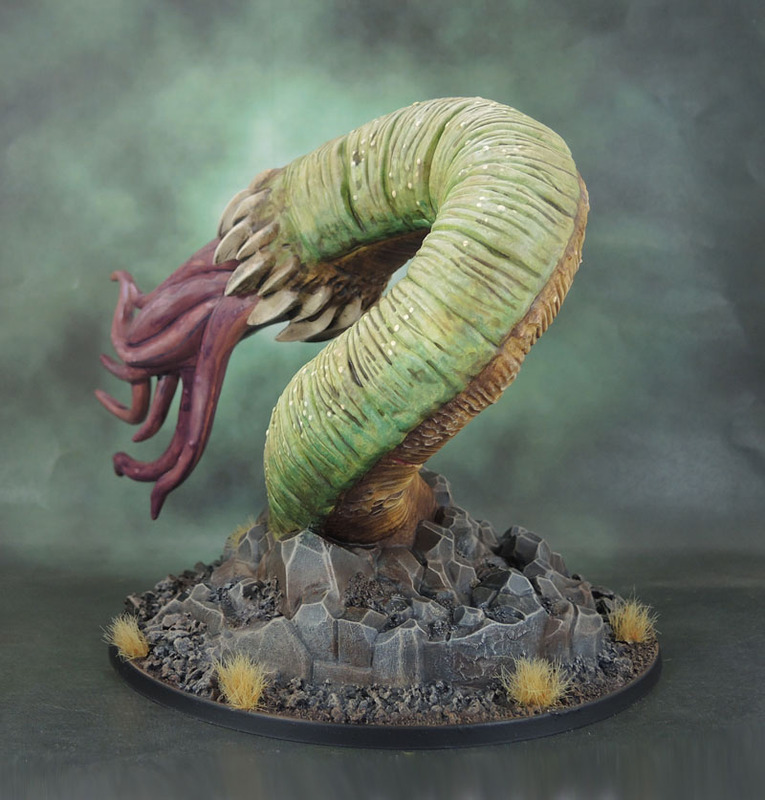 If I can manage to get in and out of the house unimpeded by Marouda and the cat tooling around out there I’ll be able to spray (Testors Dullcote is great, but super-toxic) which will allow me to flock and tuft and get the thing dry and done in time to photograph it today. Oh yeah it is a dangerous can of fumes. I use it only in the summer, and the major reason I got an airbrush set up and a spray booth. Good luck! All the painting is done. All the spraying is done (probably). Now it’s just waiting for the first layers of flock to dry so I can apply the second, then see if I need to glue it down, then final assembly, then tufts and base-flock. 6 hours left of March. It’ll be close, either way! Looks nicely Lovecraftian. I took a peek at their website, and wasn’t sure it was worth US$40, but then I came back here and took another look at the scale pic. Wow, that thing is big! US$40? I wouldn’t think it is worth that much. I got it as part of the “Mine Cart” KS pledge (though it was something like 2 or 3 years late). It’s certainly big, though it’s pretty simple as well. As best I can tell from the scale photo, that thing is on something like a 100mm base, putting it somewhere around the same size as the ETB Redemptor Dread, which also retails for US$40. I am unfortunately not aware of any other hobby challenges until DreadTober rolls around again. There may well be some, I just don’t know about them. 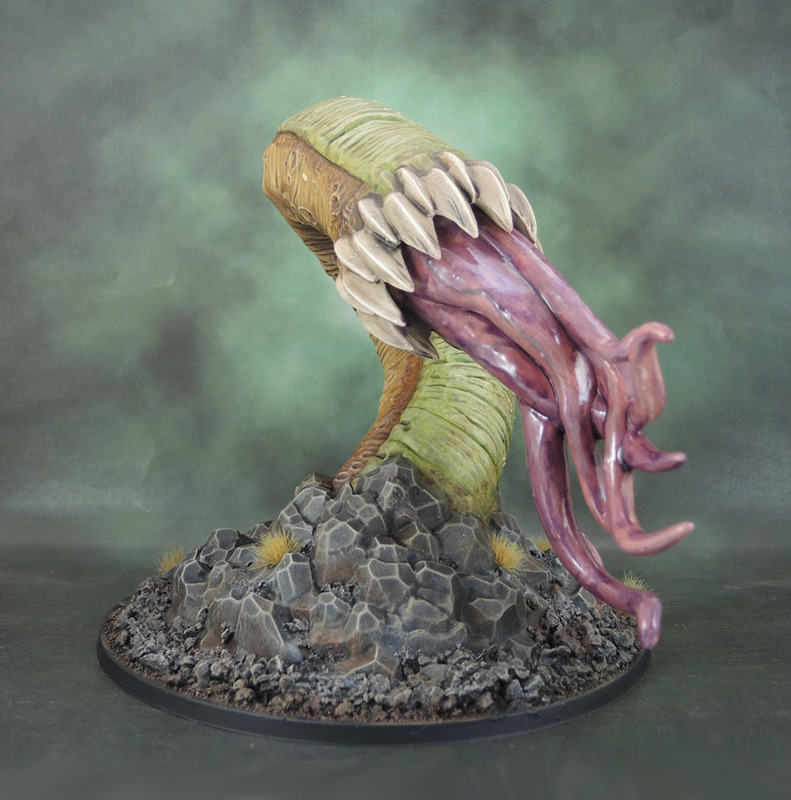 I’ve used the same kind of base as the Rogue Idol, that being one of these from Reaper – 130mm Round bases. Unfortunately, I haven’t opened up any of my Redemptors yet, so I can’t do a comparison. As for challenges, I’ll just have to keep on doing my own. It was kind of interesting to have some secondary objectives to work on as well for the last few months, though. Very nice, I especially like the two tone skin and the shading/highlighting on both sides. Good to see that even Nurgle himself has given you his blessing. Or did he send you his plague first to tempt you into his garden for salvation? Watch out for any unexpected horn growths! I hope you do get better soon! Me too. It’s gotten bloody old. 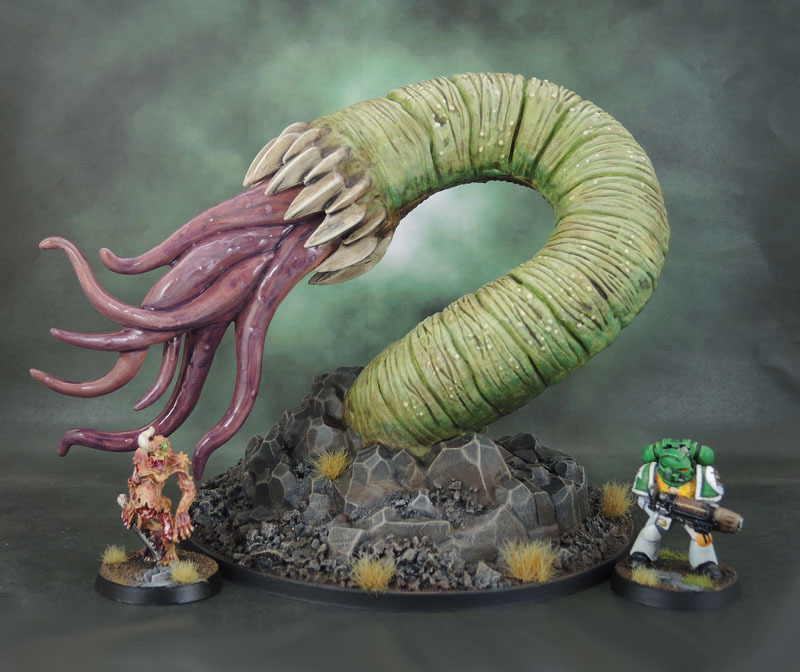 That Burrower is a fantastic army for your Nurglite force! 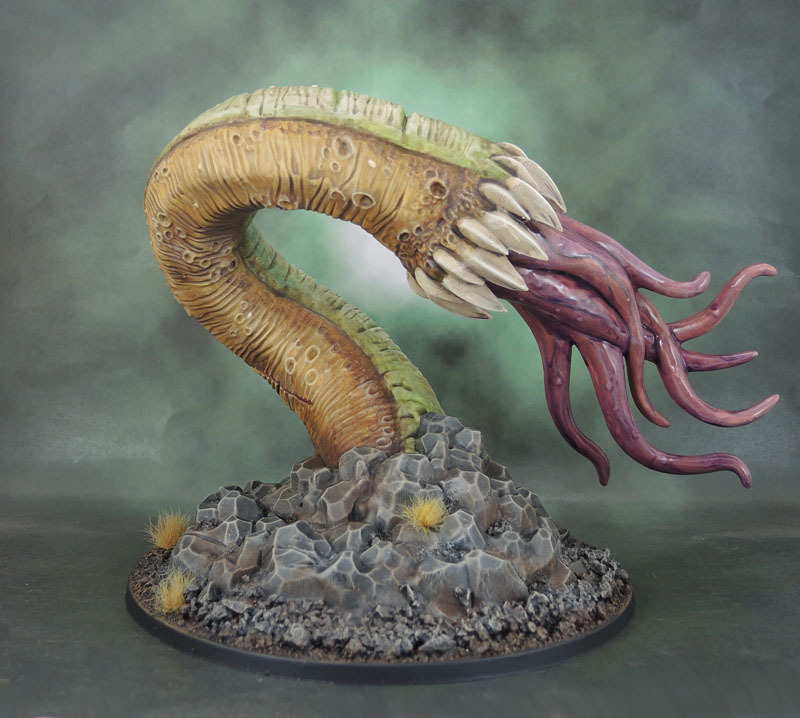 I also like the sculpt well enough — except it’s better not to think too long about where the creature is keeping all those tongues/tentacles when its mouth is closed. Your paintjob is absolutely brilliant, though, and perfectly sells the model in spite of its minor shortcomings! Thank you – and that’s the same thing/first thing I thought of when it was unassembled, and then again when I received it back fully assembled. Where the hell does it actually *keep* those tentacles? The only answer that even sort-of explains it, is “Because Daemon”, which kinda works for Warhammer and much less so for Shadows. 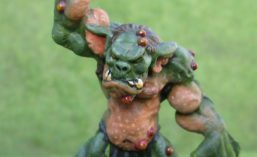 Pingback: Rogue Idol of Gork (or possibly Mork): Forge World/Warhammer Forge (Monster March ’18) | Azazel's Bitz Box. Looks great. As all your stuff does. Might have to look that one out for one of my own wormy forces. The brimstone stuff is very nice, my martian science drones are theirs, and their swamp slugs have great potential. Yeah. I need to (find time to) go through the giant box of KS stuff they sent me. 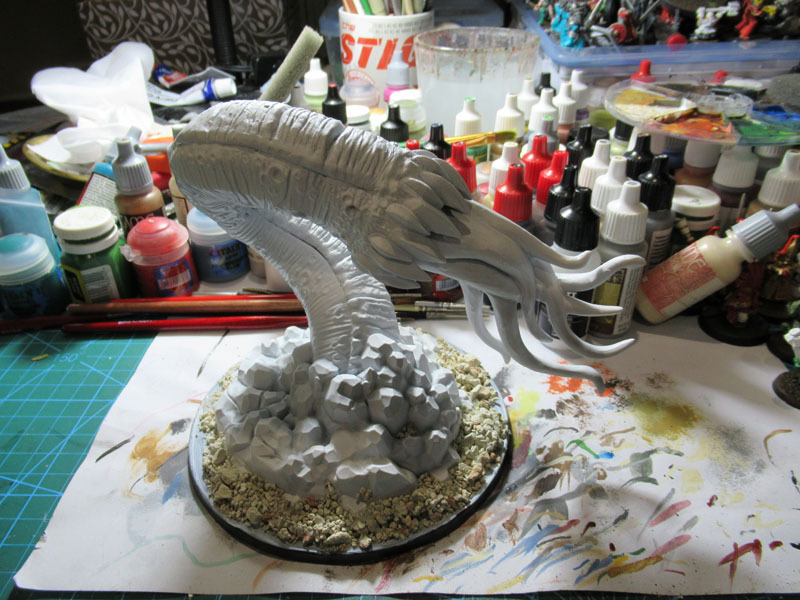 I do have the tentacle set and a demon-thing out on the modelling table, so we’ll see when they actually get sorted out! Thanks Alex. I’ve realised/decided that I need to make a more concerted effort to get some more of the “big stuff” assembled and painted. I should have given the post a pun-title. “Purple Vein.” Except it only just came to me then. Pingback: Painting Reaper’s Bones Goremaw – Looking for Feedback. | Azazel's Bitz Box.